These days, it seems like everyone is decluttering. From the KonMari method to minimalism, current trends indicate that people want simpler, cleaner, less cluttered lives. Going minimalist can be a process, and one of the first steps on the journey is to declutter your home, getting rid of items you no longer need that are simply taking up space. Although decluttering your closet or your basement can feel amazing, there’s no doubt that it takes a lot of time and effort. If you’re looking for small places to start, here are five spots in your home that you can declutter in under 20 minutes. Your bedside table is an important spot to keep organized. Not only is it a catch-all area for things you discard at the end of the day (hair ties, jewelry, phone accessories, magazines, etc. ), it’s also a spot that, when kept neat and clean, can make a big difference in your quality of sleep. Keeping your bedroom nice and organized as a whole can make it easier to de-stress and relax. Best of all, decluttering this oh-so-important spot doesn’t take any time at all. Have you looked in your bathroom cabinet lately? Though you probably use it daily, you may find that you have to push aside a plethora of items that aren’t particularly useful. Old makeup, dull razors and bobby pins can easily accumulate here, and many of us find that we’re toting around not one, but sometimes two or three extraneous pairs of nail clippers, bottles of face wash and other goods. 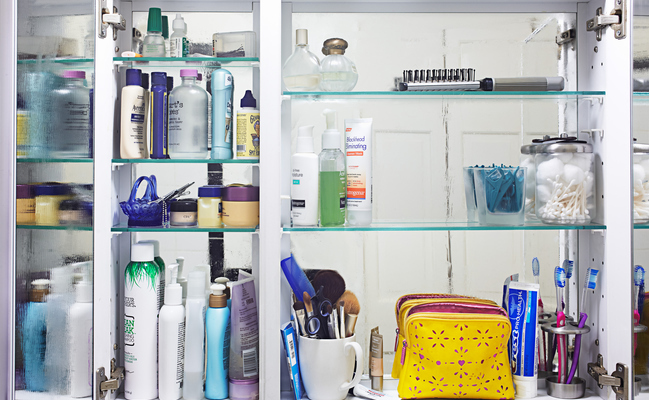 Go through your bathroom cabinet and recycle everything you’re not really using. The kitchen sink is one of those spots that some homeowners avoid like the plague. Who knows what’s hiding under there?! It’s time to face your fear and go through this twilight zone once and for all. Get rid of old bottles of cleaner, used sponges and other remnants. Give the area a deep clean while you’re at it. A lot of people in health-conscious circles give exotic foods and health foods a try every now and then. While it’s great to try new things, chances are, there are some food items in your pantry you’re probably never going to use. (Remember that time you bought seaweed paper to make homemade sushi, and then never actually used it?). Go through your pantry and gather anything unopened that you can bring to a donation center. While you’re here, you can also get rid of any unhealthy foods that have been keeping you from obtaining your health goals. Finally, going through your purse can be a fantastic way to make your life a little lighter. Marie Kondo, creator of the KonMari method, advises cleaning out your purse every single day, and placing your keys, wallet and other must-have items into a drawer or other “home” within your house. Trust me, you don’t need those old receipts or gum wrappers. It’s time to get rid of them! I don't even carry a purse-it's just one more thing I have to worry about getting lost, stolen, forgotten, or robbed. If I can't carry what I need in a pants pocket, then I don't really need it in the first place. The bathroom medicine cabinet just has the bare basics, so no worries there, and once our younger daughter is old enough to use adult cold medicines and OTC painkillers and not the kid stuff, that'll clear up even more space in there. The foods in the pantry get rotated out as they get used up, so no worries there. Same with under the sink-we don't use much for cleaning, so we're good on that score. Now if only my husband and kids would stop using MY nightstand as Grand Central Station for their papers, mail, and other stuff.... And people wonder why I grumble about not having any space to myself! I'll start with counting how many books I have. I haven't started decluttering yet but I have thought of decluttering so I'm halfway there. Good reminders. :) Thank you. If you saw how much stuff I have it would shock you. It looks like a thrift store.